Owning a dog provides companionship, but also a reason to get up in the morning, which are both vital to the physical and mental health of a senior citizen. Countless studies have shown that having a canine companion in one's life, especially an elderly person, can help reduce blood pressure. Other studies have shown that a dog can help increase a person's chances of surviving a heart attack, as well as assist people with Alzheimer's disease. "Studies have shown that Alzheimer's patients have fewer anxious outbursts if there is an animal in the home," according to Lynette Hart, associate professor at the University of California, Davis School of Veterinary Medicine. 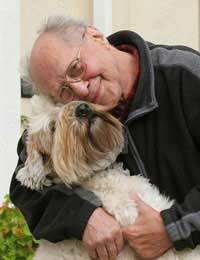 Dr. Hart also noted that Alzheimer patients who have a pet reported fewer mood disorders.Dogs provide constant companionship for a senior who may have few friends or who may be physically restricted from partaking in regular social activities. Knowing that one's parent or grandparent has the constant companionship of a loyal canine also helps to reduce the stress other family members or caregivers may feel because they are not available for the senior as much as they may want. When it comes to older people owning dogs, not all dogs are suitable. The two most important issues to consider when choosing a dog for a senior are the dog's temperament and size.Smaller dogs are the preferred choice for most seniors as they are small enough to be carried around, which is important for veterinary visits, but these 'lap dogs' also love being lavished with attention all day long. You must also remember that not every small breed will have the appropriate easy-going temperament that seniors require. Some small breeds also require a lot more grooming than others, which may be of concern for a senior who is on a limited income and can't afford to take the dog to a professional groomer on a regular basis or who is not physically capable of regularly grooming the dog him/herself. When deciding to get a dog, seniors should avoid puppies, as they require a lot of work in terms of housebreaking and obedience training, and can challenge the quickest of people. A puppy's small size and quickness can trip up a slower senior and cause the person serious injury. Dogs that are six months and older are generally good choices for seniors, as some of the puppy energy has dissipated. As well, the dog may already be housebroken and obedience trained, which makes life that much easier for the senior. If the senior is comfortable with, and capable of, handling a larger dog, he or she should, again, consider one that is older and much calmer than a puppy. A dog that is one or two years old will still require regular exercise - like a walk around the block, but he will be more apt to go at the senior's pace, rather the owner being pulled around the neighbourhood by the puppy because the owner is walking too slow.